We are always surrounded by mathematics in our daily life. From the design of buildings to architecture, from flowers in nature to the rhythmic meter in songs, from time in a day to the days in the week and seasons, all have mathematics naturally built into them. There is a universal human need to calculate and convey quantitative information. How can we explain this idea that we need to calculate? It’s part of our human nature. It’s our “mathematical mind.” The mathematical mind is characterized by these abilities: curiosity that leads to investigation, accurate observation, reason and judgments, the ability to create order, the development of language and to be able to use that to classify things, repetition leading to exactness and abstraction and new constructions. 1. Numbers 0-10: In this area the child is introduced to quantities and their corresponding symbols. One example of this work would be the Number Rods. 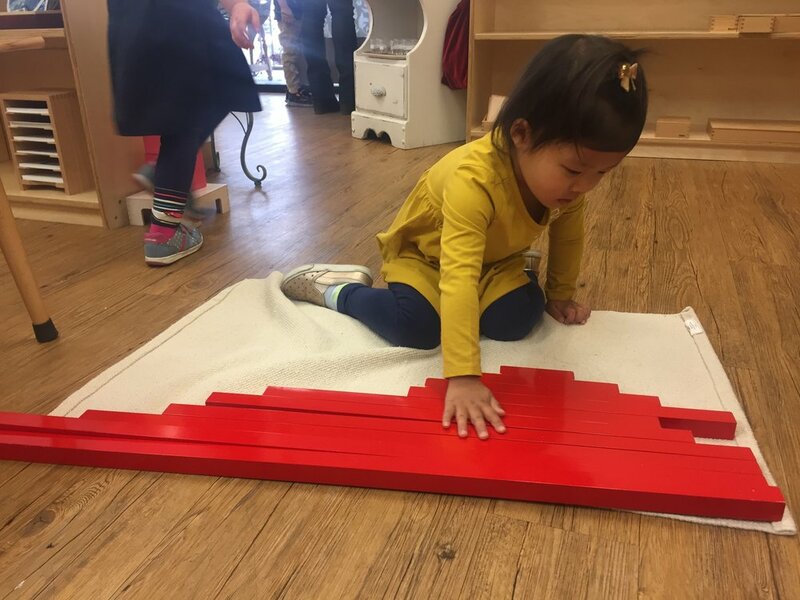 This work helps the child to learn the names and sequence of the numbers 1 to 10 by using ten rods alternately painted red and blue in sections to represent each quantity starting from 1-10. 3. Continuation of Counting: This bit is when the child gets an opportunity to count up through 1000! Very Exciting! One infamous work that demonstrates this is our 1000 Chain that is a chain of… yep you guessed is…1000 Golden Beads! The children love to count this chain and placing the numbered labels pointing to each corresponding bead. This work is so enticing as it can stretch completely across the classroom floor! 4. 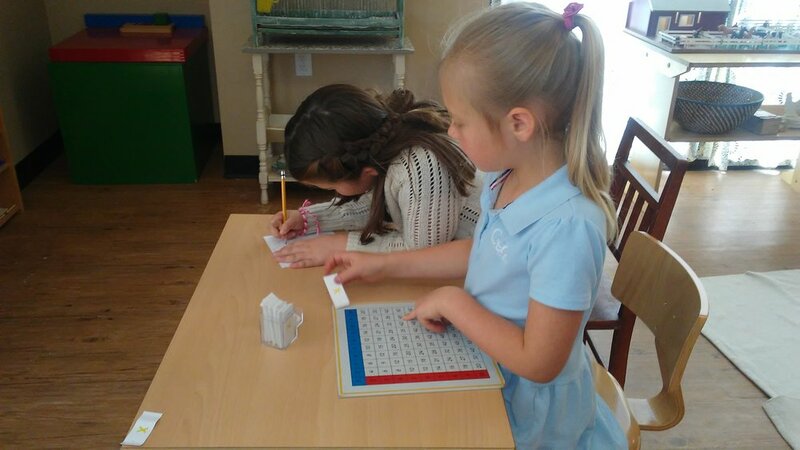 Memorization Work: During this time, the child engages in work that helps him to memorize math facts or essential combinations as we refer to them in a Montessori environment. One particularly fun work for memorization is the Addition Snake Game. 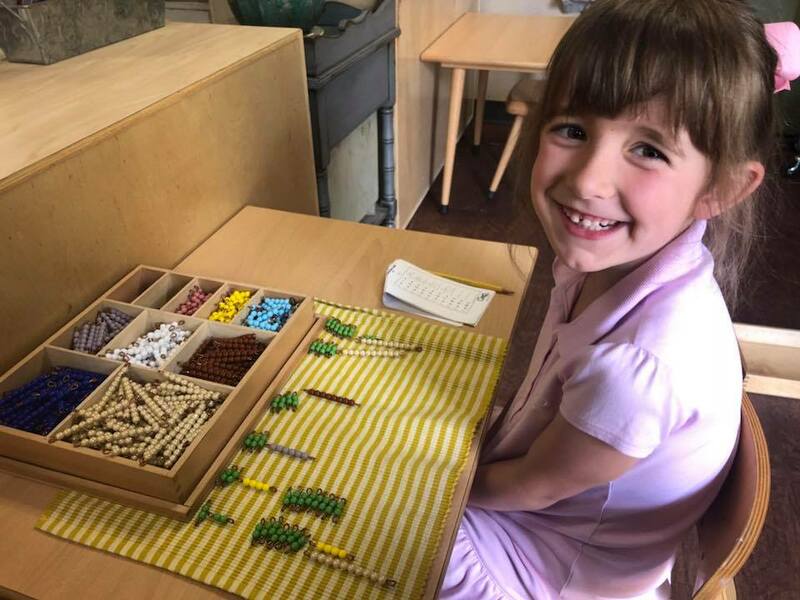 In this game, the child becomes familiar with all the possible number combinations that might make 10 by building a snake out of beautiful colored beads and then using his knowledge from the Change Game to exchange them for a golden 10 bead. 5. 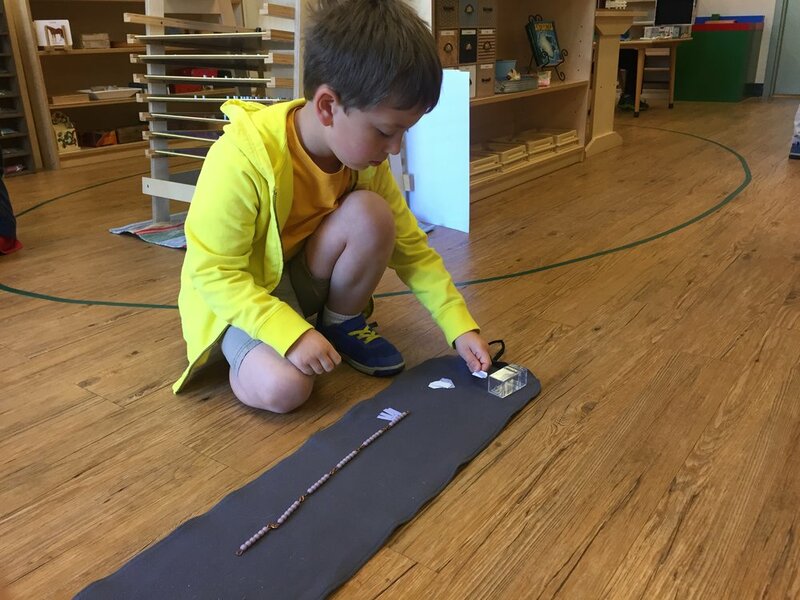 Passage to Abstraction: This allows the child to experience math in a more abstract way and this is also when he will be introduced to even larger quantities such as 10000, 100000, 1000000! 6. Fractions: At this point in time, the child is introduced to the concept that a unit can be divided into parts and that those parts (fractions) can be applied through addition, subtraction, multiplication and division. Truly remarkable work for a 5½-6 year old! To clarify that symbols represent a certain quantity of separate objects and introducing zero as an empty set. Further exploration of the essential combinations in subtraction and offers the possibility of repetition. To show the geometric form of multiplication demonstrating that the multiplier is not a solid body - it merely indicates how many times a quantity is repeated - and a succession of lines creates a plane (surface). Further memorization of the essential addition combinations. A concrete representation of Long Division. To give the child another means of counting in a series and more practice in linear counting. To practice multiplication leading to memorization of the essential combinations. 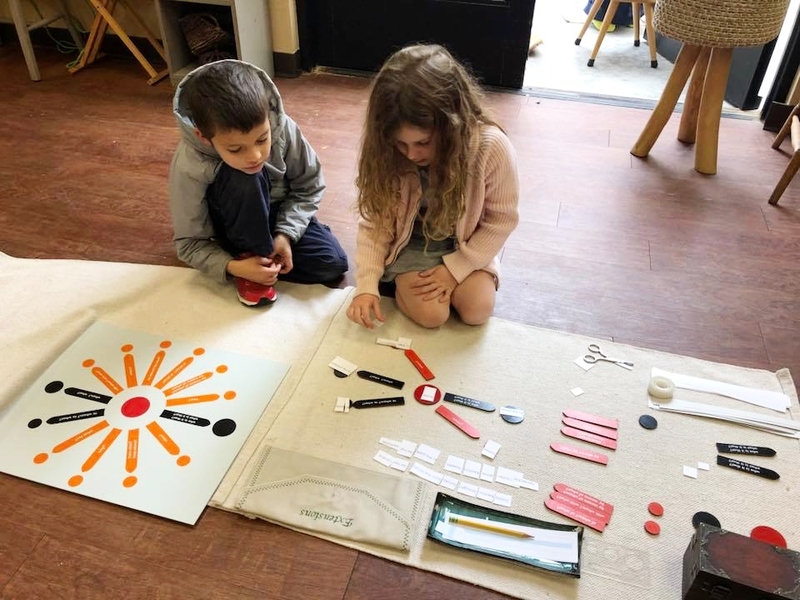 To give the child a beginning understanding of the nature of fractions. The child draws a problem from the pouch and uses their fingers on the chart to find the answer. Then they write down the entire equation on their paper. 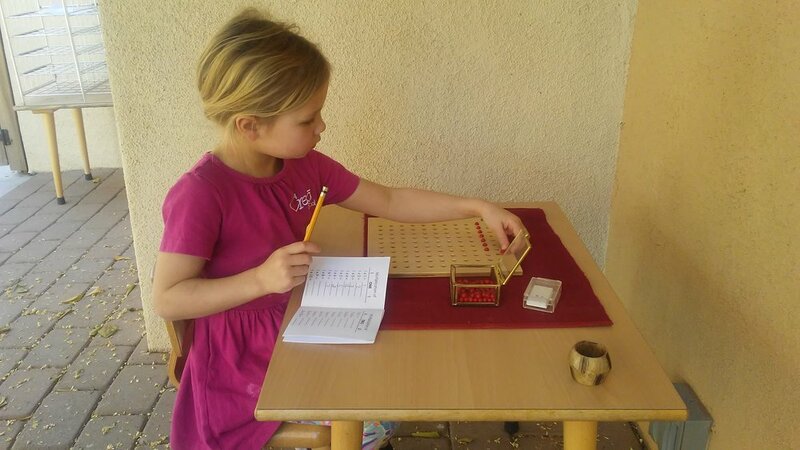 To offer an opportunity for the child to apply memorized knowledge of the essential combinations. Wow! Spring time is here and we are very busy getting back into our classroom routine after our Spring Break. Spring has definitely brought some beautiful 6 foot tall sunflowers to our garden and we see a few more popping up. Our delicious herbs are thriving as well. Especially our mint. Yum! On another very exciting note, we have noticed that our female bird has laid three eggs. We are anxiously awaiting to see when they hatch. A few children have done research to learn about the finch incubation period and have made a list to hang next to their cage predicting the hatching date. We've also taken a poll for possible names. Needless to say the children are VERY EXCITED! The children work together to set up for one of our many celebrations~lots of teamwork! The child explores with them, designing and building things. They notice the contrast between the cylinders from each colored box. The child uses fine motor skills to find which key unlocks each lock. The child uses his coordination of hand a paper to cut along printed various lines. This activity requires that the child have a certain level of self control and ability to handle long sequences of activity. He usually peels the banana, slices carefully, places each piece onto a plate, and then must clean up after himself. We’re (March)ing right along toward the end of the school year. 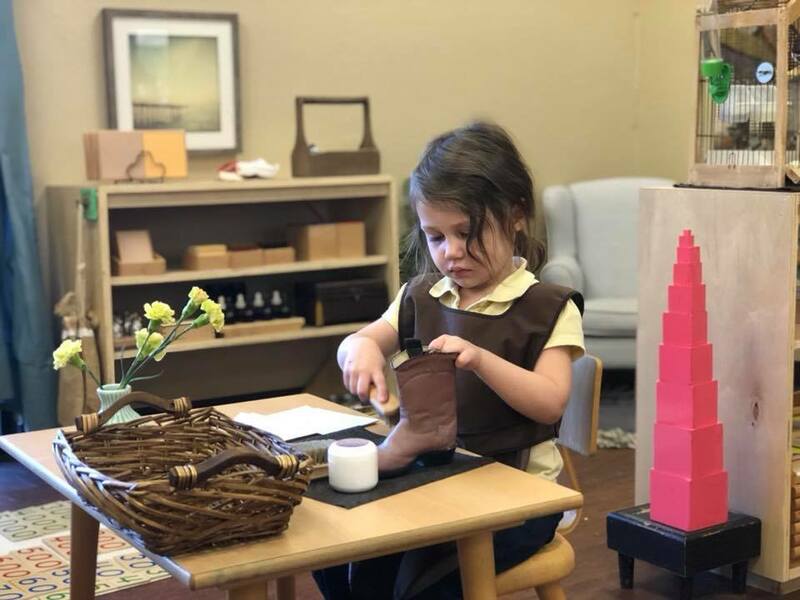 This is such an enjoyable time in the Children’s House as the children have reached their maximum level of “normalization.” This is a term that Dr. Maria Montessori used to describe the child’s love of work, concentration, self-discipline and sociability. We have been observing a great deal of confidence and pure happiness radiating throughout the environment. The children have been creating salads and various concoctions from our garden, many inspired from looking through our cookbooks. We’ve had the pleasure of supporting two Student Teacher’s in the environment so far this year. The children have been impressively welcoming, well-mannered and eager to receive lessons from our guests. We welcomed Maverick into our class toward the end of the month and our classroom is officially at capacity! April is sure to bring as many smiles as March did; Spring has arrived! The child identifies and follows a sequence to polish a leather boot. The child was pleasently surprised to find a bell pepper ready to be harvested for her salad food preparation activity. Once the children have acquired the language of the countries in North America, they are provided with labels to read and identify them. Labeling the geometric properties of the solids. The children were excited to experiment with a new recipe this month: cinnamon buns! The child uses various triangles to construct quadrilaterals. The child is happy to work with a concrete material designed for the exploration of multiplication math facts. Imagine the joy this child feels when she is able to confidently read a story to a small group of children. The children enjoy playing a collaborative game of charades. Category: animals. This practical life exercise will help the child develop independence when dressing. Developing concentration, control of movement, order and care of the environment. The children decipher grammatical forms in an interactive way. This is a step toward total reading. 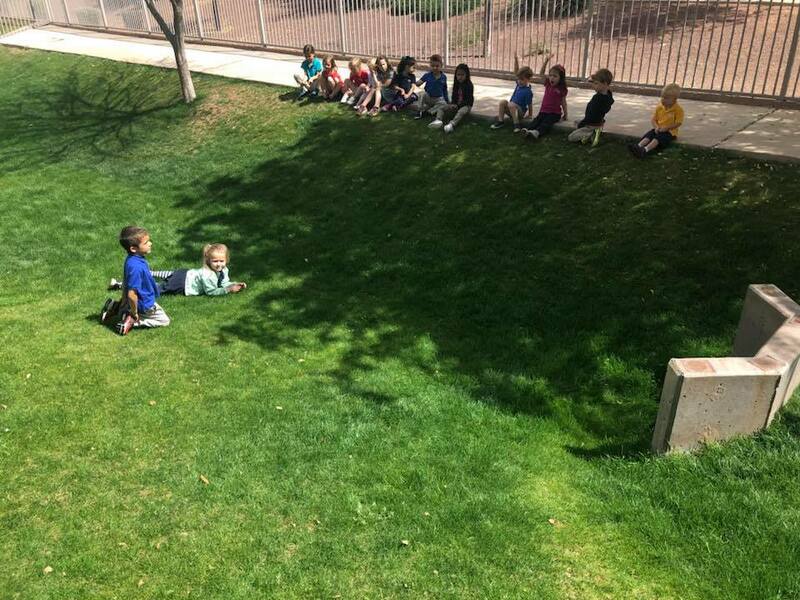 This activity is jam-packed with mindfulness, concentration and allows the child to demonstrate care of the environment. To help the child become aware of the hierarchies of the decimal system up to one million by quantity, symbol, and name. The child works with a pairing exercise whilst refining her senses. I hope everyone had a peaceful spring break. As the weather starts to warm up, the mosquitos will be making an appearance. Please apply bug spray and sunscreen before school. If your child will need extra applications throughout the school day, stop by the office and drop off the bottles and fill out the medical release form. This month we have been discussing Cultural Story Telling. How these stories are part of a family’s history. They are often verbally shared from one generation to the next. Sometimes, they are written down. They are meant to tell a cautionary tale, moral lesson, or the history of the family tree. Depending on the culture, the main characters in the story can take the form of an animal, nature, or any other form that is relevant to the culture. I have share with the children a couple of stories from my culture both in written form and verbal story telling. I look forward to seeing everyone at next month’s parent night. I have also sent out through Schoolcues a classroom update. Please share the update information with your spouse if they are not on the email list. Using the third color box in order to develop chromatic sense and expose the color keys of the world to the child. With this work, the child repeats the essential multiplication combinations. System of lakes water form study is in preparation for further studies of the physical make up of our plant. 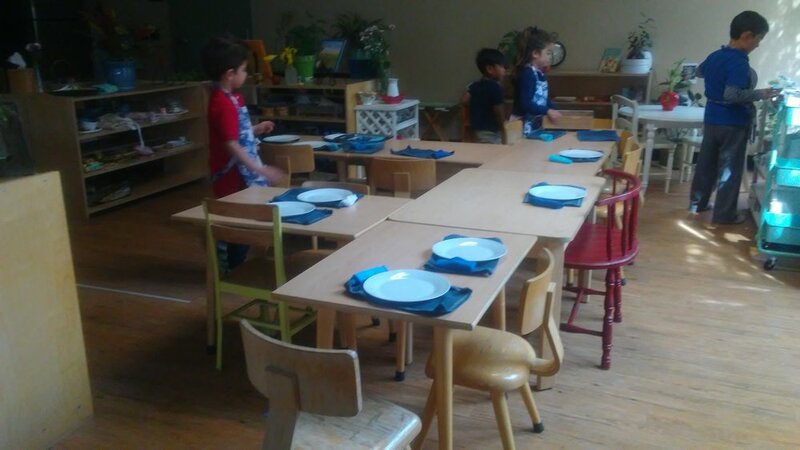 Baking together builds on socialization skills, math skills, order, and control of movement skills. 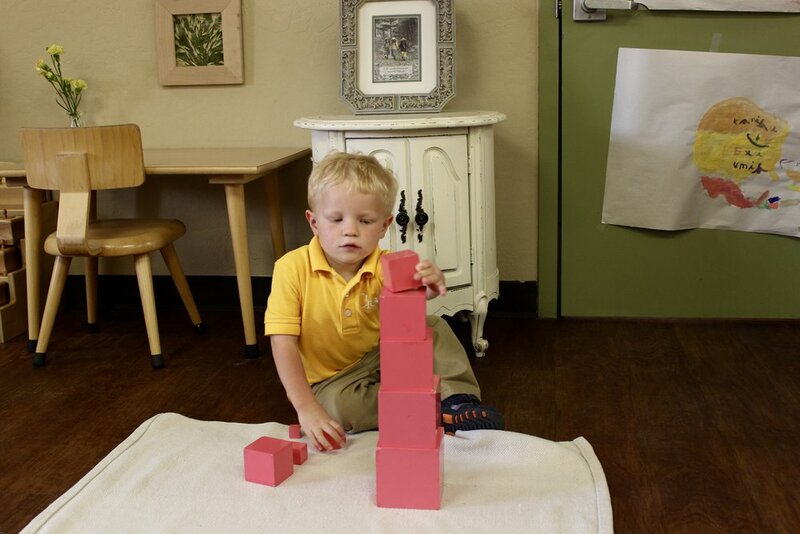 Practicing the formation of the letters, building muscle memory, and control of the hand. This child is using the moveable alphabet to build words from the sounds she has mastered. This child is exploring the many flags of the world. She finds the flag of her choosing in our flag book. 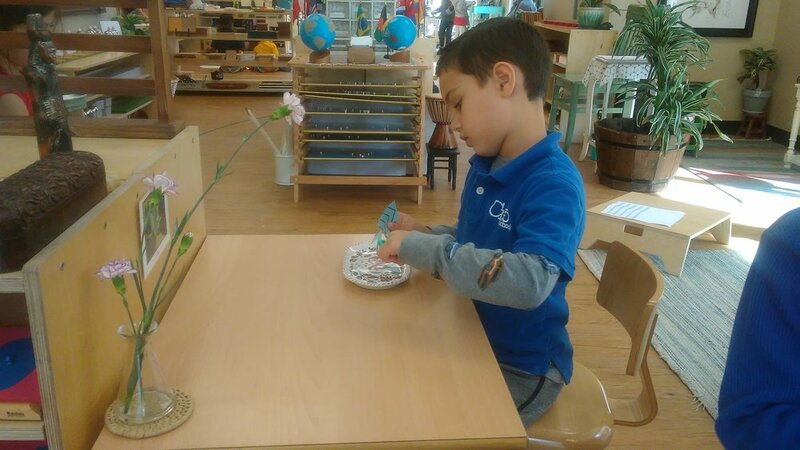 This activity encourages fine motor skills, concentration, and order all necessary for future work in the Children's House. Working with all the cylinder blocks to bring order and visual harmony to the varying degrees of dimension while preparing the hand for writing using the three finger grip. This child is writing down a poem she likes to read. This encourages hand writing and the appreciation for poetry. 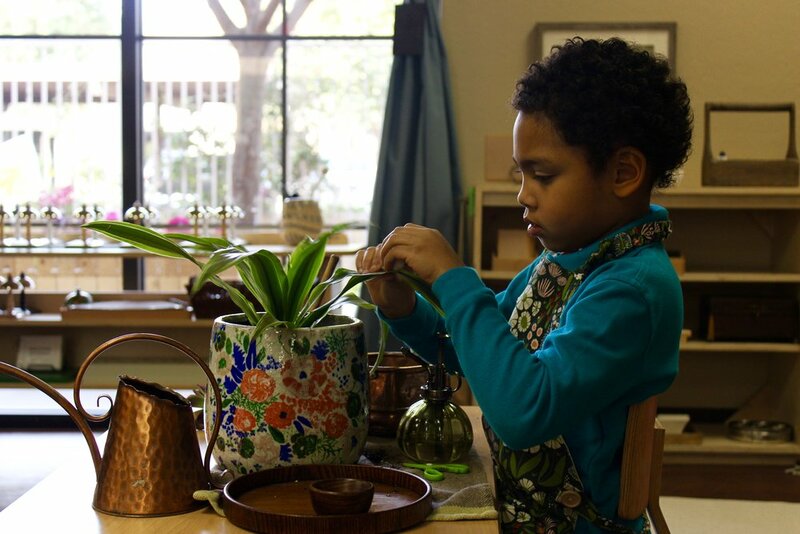 Caring of the environment gives the child a sense of ownership in the classroom. Preparing the hand towels for lunch is a long activity and requires the child to concentrate for an extended period of time, have organization skills, and fine and gross motor skills. Folding cloths takes precision, concentration, order, and independence. Exploration of texture through the rough and smooth boards. This child uses muscular control for lightness of touch, refinement of tactile sense, and prepares the hand for writing. 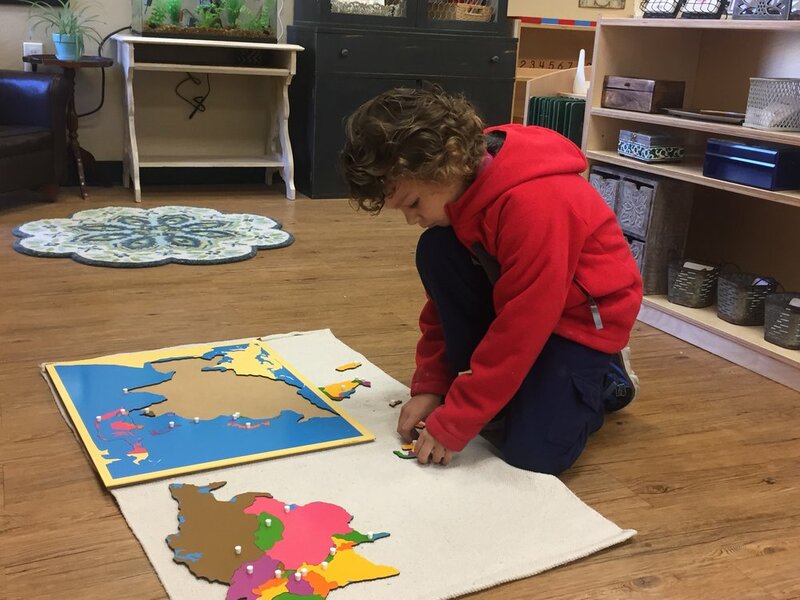 This child uses the painted globe to further his exploration of the third color box. Happy Spring dear Jackrabbit families! Hard to believe an entire school year has almost gone by. We have grown so much this year and I am so thankful for all your trust and support. The children are thriving and it is very fun to see their growth. We have finally seen some growth in our gardens too. We have beautiful flowers and even some vegetables. The children got to taste some sweet red peppers and radishes. It’s amazing to see how willing they are to try new things. During our last refresher course we attended we learned that a human being must taste the same food about seventeen times before we can’t certainly say that we don’t like it. Try to be adventurous with the foods you offer your children. Lunch time is a great opportunity to try new foods. Pack things that they haven’t tried before. Little bites of different foods they can bring to school might be the key of success. Also remember to please pack these items in small glass containers that they can open by themselves to promote their independence. We would like to thank CaliAnn and her family for taking care of our birds, Charlie and Lucy, during spring break. Also thank you to Rose's mom for coming to our classroom to share with us their Persian New Year traditions, it was very fun! We are looking forward to the next couple of months! Children learn sewing techniques by following a traced shape on burlap.